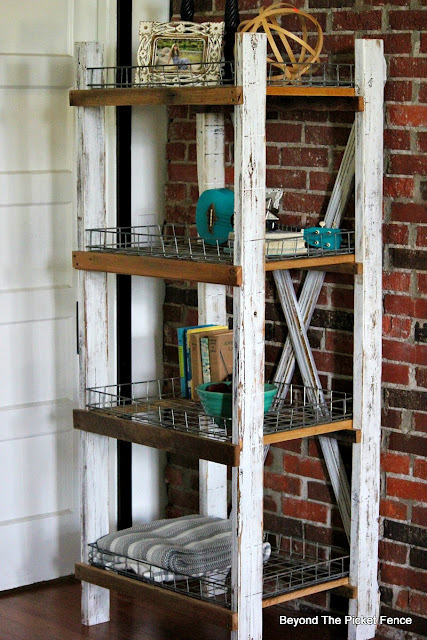 an industrial farmhouse style shelf--it just took me a year to finally get to it! This build was one of those hands on, learn as I go, building events. And I know, some of you are saying, "That is nice Becky, but I will never find wire basket trays like these!" Check out the end of this post for some other options! I knew I wanted to use 2"x 4"s for the four corners. These are from some old fencing we found on Craigslist. 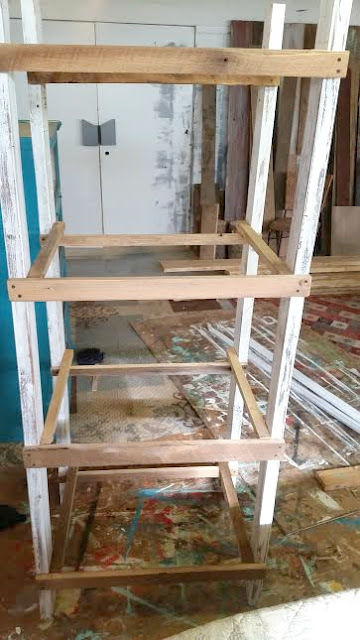 Scrap 1"x 2"s (roughly) formed the shelf braces. I painted and distressed these before putting the shelf together. At this point I realized I was not thinking very clearly with my original plan. I thought I would just set the wire trays on the brackets, put an X on the back and be good to go. Ha-ha, there was nothing to keep the shelf sturdy or secure. So, I decided to add cross braces on the top and bottom shelves, in both the front and back. I cannot express enough how helpful clamps are! They are your second or even third pair of hands. They hold things in place, they square things up. Clamps are your friends! 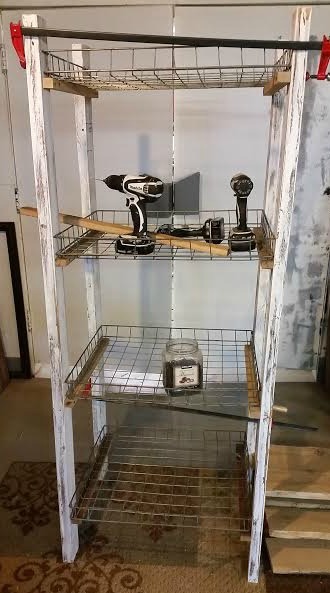 The shelf was much sturdier then, but I wanted it more secure so I added braces on the middle two shelves. 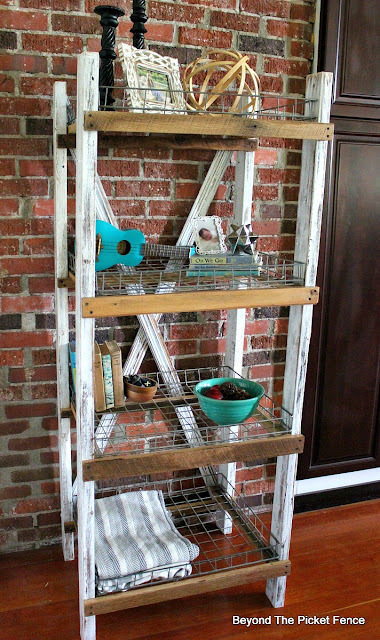 I put the braces across the front of he shelves and on the inside of the back 2"x 4"s.
To make the X I used old trim boards (again painted and distressed first). The trim boards have enough flexibility to cross over each other in the middle. I screwed them in place at the 4 corners and then used a pencil to mark the angle I would need to cut them at. Then I took them off again and used my handheld jigsaw to cut the angles since they were too sharp of angles for the chopsaw. I attached the X boards which made the shelf very sturdy. The wire baskets are in there tight, but they can slide in and out. 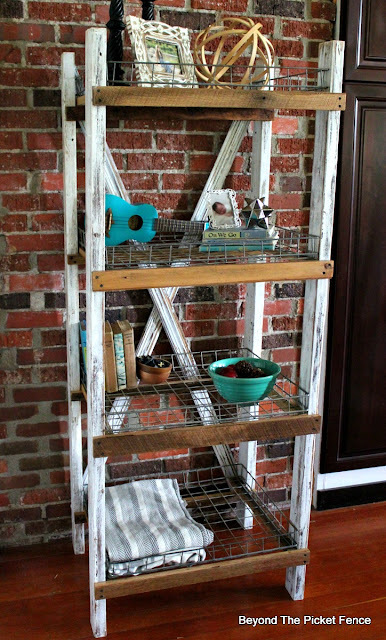 NOW, if you don't have wire baskets, you could use large metal cookie sheets (thrift stores usually have some! 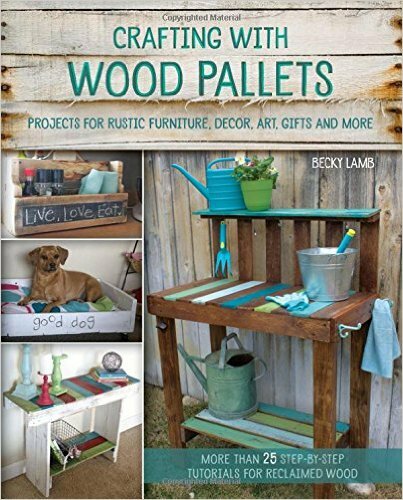 ), plywood pieces that you paint or decoupage, or make simple wood trays for the shelves. 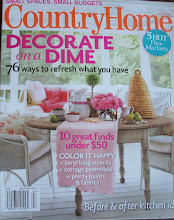 So many ways to personalize this piece and so many places it could be utilized! Totally love how this turned out! Oh gosh, thank you Christy! I have fun! Thank you Tenneil. Yes, the industrial vibe definitely makes it more contemporary! Thank you, it was fun to see it come together! Wow! What a fun piece of furniture! 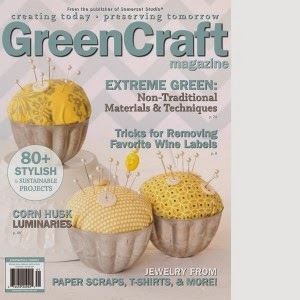 I like the ideas at the end for other shelf materials. Thank you! Yes, I am collecting cookie sheets now to make another shelf! Thanks for other ideas to use in place of wire racks, leave it to you Becky, always have an answer and ideas. 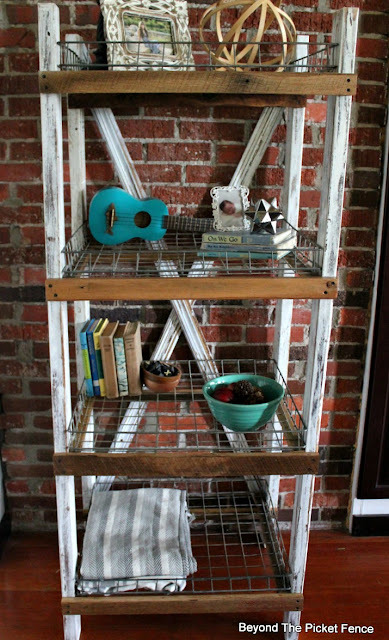 Love your shelves cause they're made with old things you scavenged and made do with. What lucky break finding those bread racks at thrift store and remembering what you wanted to do with them even after a year. This is what can't get thru hubs head, grab something possible even if you don't use it right away, will someday as you did.